Last week, EA Sports revealed Damian Lillard as the official cover athlete for their upcoming next installment of their NBA LIVE series. 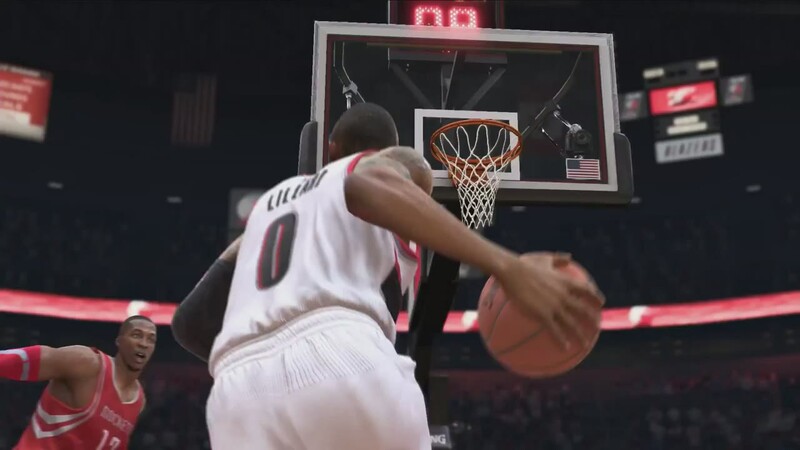 With the game’s official release only few weeks away, we’re granted official gameplay footage in EA’s newest NBA LIVE 15 trailer visuals trailer. New animations and obvious visual improvements are noticed throughout the brief clip, including recently acquired Cavalier Kevin Love in his proper jersey attire. Unlike last-season, the EA team has taken necessary steps to take a giant leap ahead in presentation and most of all game-play for Xbox One and PlayStation 4 consoles. Get a taste of the action below, along with a list of newly revealed features to expect on October 7th. We’re doubling down on visuals with an all-new scanning and lightning technique for the most photo-realistic player models in franchise history. Add into the mix player specific body types and contextual emotional responses and you will truly feel like you’re in the action. Feel the impact of real-time physics on every drive, post move and collision in the most trafficked area on the court. 100+ new animations make it possible for something unpredictable and amazing to happen on every play. Scoring has been amped up with 3x the variety of dunks, layups and signature shots as you impose your will on your opponent with physicality you can feel. Passing, shooting and dribbling will feel snappier the moment you pick up the sticks. Freestyle Passing takes your assist game to the next level with no looks, behind the backs, and more. An all-new shot feedback system teaches you how to successfully get buckets, measuring three key factors in real-time to determine shot quality. Enhancements to bounceTek allow you to make cuts and change momentum on a dime, giving you the ability to create space and pull off devastating skilled dribble moves on the run. New AI logic drives all 10 players to move with intent and purpose while displaying greater off-ball awareness, adjusting as every play develops. Add in a smooth transition game as well as real-world offensive sets and defensive schemes and you’ve got 48 minutes and 94 feet of end-to-end, dynamic gameplay. New defensive systems make it easier to contain your man by using just the left stick. Contextual physicality, bumps and jostles, in addition to a new shot blocking system, delivers simplicity in controls helping you make that big defensive stop when your team needs it most. NBA All-Star and Former ROTY Damian Lillard is your personal coach and mentor on the journey to becoming an expert NBA LIVE 15 player. Learn how to dominate LIVE like a boss with drills and tutorials wrapped in stories about Lillard’s path to the NBA. BIG Moments just got bigger. New Hot Spot Challenges allow you to replicate game-changing moments within an hour of them happening in the real NBA. The closer you get, the more bonus points you earn. Plus, all-new featured monthly events will offer fresh challenges as they actually happen, in real-time. The perfect combination of NBA LIVE 15 and fantasy basketball. Build your dream team of the brightest modern NBA stars and all-time legends. Compete online or take part in Fantasy Challenges to earn coins and purchase new packs of players, uniforms, contracts, and more. A new auction house adds even more opportunities to assemble the fantasy team you’ve always wanted.